When it comes to choosing the right dog for your city apartment lifestyle, many people are surprised to find out that size isn’t the most important thing to consider. There are breeds of all sizes that are perfectly comfortable with apartment living. In fact, they may even prefer it – more opportunity to be close to you! Nicknamed the “40-mph couch potato”, greyhounds are right at home in an apartment. These speedy sight hounds do need daily walks and some time to safely run around in an enclosed area, but once they’re done they love nothing more than curling up on the couch. In fact, some say that having a greyhound is like living with a giant cat – they spend the majority of their time sleeping and you’d be surprised by some of the small spaces they can tuck themselves into. Just because a dog is small it doesn’t necessarily mean that they’re right for apartment living, but that is not the case with the Maltese. Lacking an undercoat, these little white balls of fluff are surprisingly low shedders, which is great when living in close quarters. Plus, their relatively low energy levels means that they don’t need a large yard to run around in – a few indoor play sessions and outdoor walks are just fine. Maltese are also known for their propensity to get along with other non-canine animals, so you don’t have to worry about these pups needing their own space away from any other pets. Unsurprisingly, the world’s smallest breed of dog is perfectly happy living in an apartment, because even small spaces feel large when you’re less than 10 inches tall! Chihuahuas also need less exercise than their larger counterparts, much of which can be done inside. With a little creativity, you can create a great compact play space for your pup that will keep them entertained and stay fit. Thanks to their compact size and laid back attitudes, English Bulldogs make for great apartment pups. Anyone who has met a bulldog knows that they are the definition of a couch potato, perfectly happy to relax with you while you watch TV. While they still need regular walks, you don’t have to worry about having too much room in your apartment for them to burn off some energy – they’ll do that during their outside time. Another reason English Bulldogs are great for apartments is that they rarely bark. Some prospective owners are worried that because of their size, they don’t have space for a dog as large as a Great Dane, but this is rarely the case. As long as your apartment is big enough for them to wander around comfortably, you’re set. 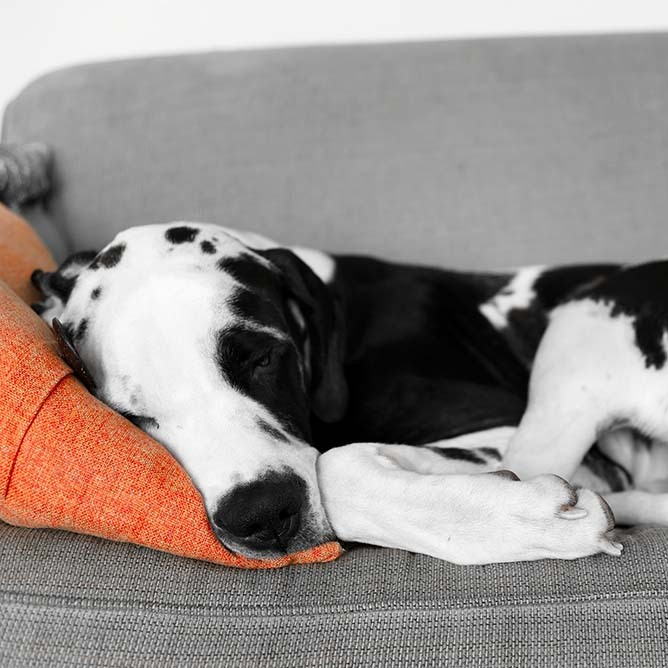 The average Great Dane may weigh in at between 100 and 130 pounds, but they have a naturally laid back and quiet disposition. These gentle giants have a slower metabolism, which means that they have lower energy levels and exercise requirements. While they do enjoy their time outside, they’re even happier when they can lounge around with you. When it comes to choosing the right dog for your city apartment, the first step is to do your research. These five breeds are known for their ability to live in an apartment, but there are a number of others who don’t care about the square footage of their living quarters. Whichever breed you choose, we guarantee that they’ll settle right into your apartment in no time. The post Best Dogs for City Apartments: Why the Size of Your Pet Doesn’t Matter appeared first on Freshpet.